Giving gifts is one of the best ways we have of cementing friendships, preserving relationships and keeping families together. Receiving a gift makes the person feel cared about, and for the giver that joy makes it very worthwhile. The only problem with gift-giving is deciding what to give and this is where trees really step up and prove themselves. You know how it goes – give chocolates and the person might feel you don’t care if they get fat. Give special foods and they think you believe they don’t eat well. Give a book and they might think you see them as uneducated. Give sports equipment and it looks like you think they need to get healthy. Gift-giving can be a minefield of misunderstanding and misread messages! Yet as humans we know the importance of giving gifts, so what are we to do? The answer is to give a tree. It won’t make you fat, it needs almost no care and it carries no hidden negative messages. Instead it brings with it a host of positive messages of hope for the future, enduring relationships and continuity in life. Really, nothing beats a tree and it may actually be the ideal gift from anyone and to everyone. So don’t hesitate, send your loved one a tree to really show your love – you and they will never regret it. 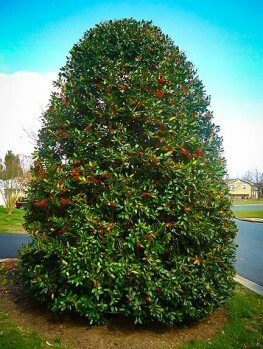 In years to come when they look at that splendid specimen in their garden, they will remember you with warm feelings and re-live the moment that young tree arrived at their door. The joy they felt then, and the success you felt too, will live forever in another living thing – a Gift Tree. When it comes to making that gift choice, plants tick all the boxes and stand out as the ideal gift for so many different occasions. Because they live and grow after giving, they symbolize the meaning of gifts as a mark of permanence. ‘I give you this tree so it will grow like our friendship.’ If we are parents, we can give a tree when our children have their first real home – it will grow and mature as we wish their life to – stronger and more beautiful with each passing year. There is a deep human connection with the earth and with our Planet, so that planting a tree has real meaning for almost everyone. A tree means hope and faith in good things to come. It speaks of progress towards a better future and a belief in the continuity of life. 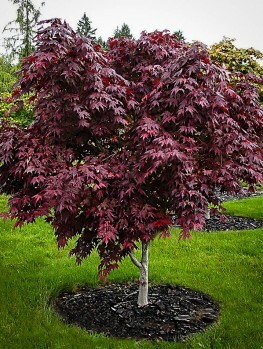 The ceremony of planting this gift tree also becomes part of the gift giving process. Even if you cannot be there, when the tree is planted a long-distance bond will be created that will endure and make both people feel better about being apart. Gift giving is especially a way to feel better about being apart. These days so many of us live a long way from family members and old friends, and we can all feel bad, and a little guilty, that we are not together more often. Now that ordering online is so easy, that gift we send is a replacement for not being there. You feel better for having done it and the receiver feels the warmth and knows you care, even while you are apart. Everyone feels happier and that is surely what life is all about. 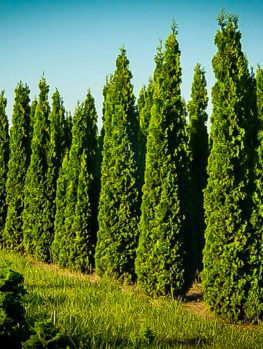 Because there are so many trees, in so many sizes and with so many different features, it is easy to find just the right tree for any occasion. You never need to worry about it not fitting, or being the wrong color. It is also a mistake to see giving a tree as putting a responsibility onto someone. Unlike pets, plants are independent and they will just do their thing without needing constant, or often any, attention from their owner. 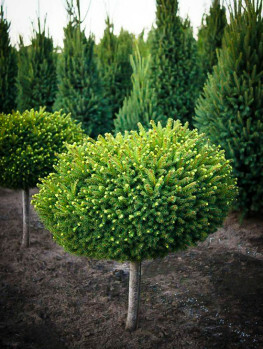 These trees have been chosen by our expert staff because they really have something special about them – making them really suitable for gift giving. The Himalayan Cedar is a majestic forest tree that is sacred to the people who live in the Himalayas and who call the tree Devadaru, meaning ‘Divine Tree’. However the wild tree grows to around 150 feet or even 200 feet in the wild, making it is a little large for almost all gardens. 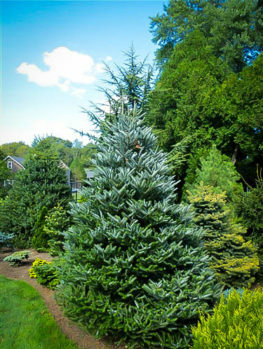 So we have chosen a special selection of this beautiful tree, called the Divinely Blue Himalayan Cedar, in honor of the sacred character of this tree. 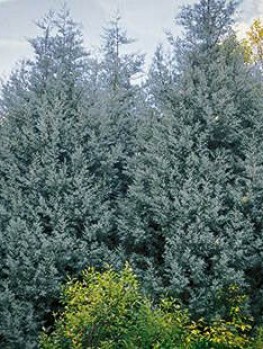 This beauty has stunning silver blue needles on its horizontal branches and forms a graceful mound of foliage that will be 6 feet tall and 3 feet wide in time, living for many, many years and adding elegance and grace to your garden. 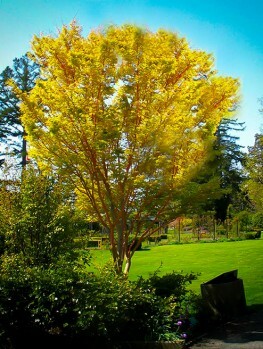 This special tree does well in areas with cool, damp winters and summers that are not too dry. 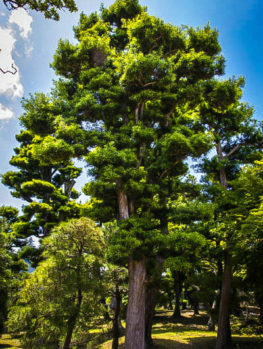 The Hinoki Cypress grows wild in Japan. 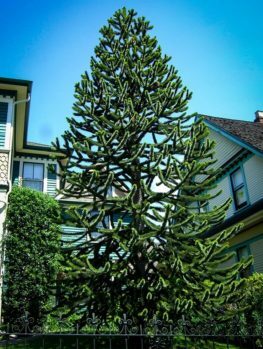 It is a large forest evergreen, growing over 100 feet tall. 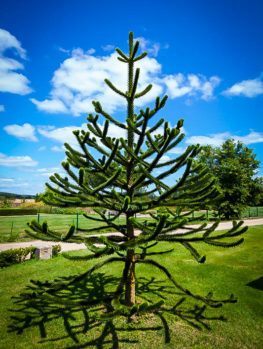 Because this tree is too large for the average garden, we have chosen a smaller form that not only fits gardens better but brings a wonderful light to them as well. 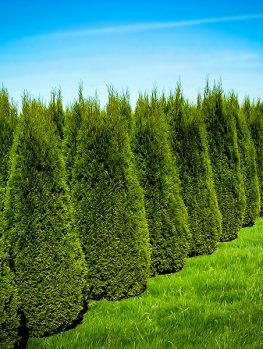 The Lemon Twist Hinoki Cypress not only has brilliant lemon-green foliage all year, it stays below 6 feet tall, spreading to about 5 feet wide in a beautiful, slightly weeping mound of fine foliage. 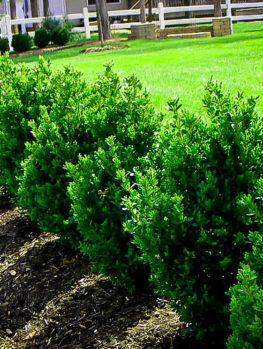 The foliage is twisted and develops curious twisted and curled sections that make for a unique gift tree that is easy to grow and thrives in hot, humid areas. 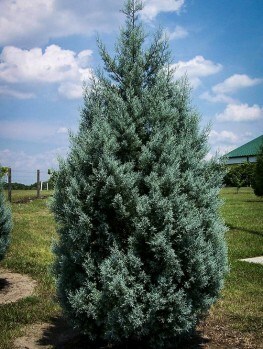 Junipers are always popular for their toughness and drought-resistance, as well as their attractive evergreen foliage. 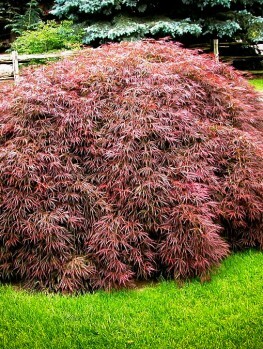 The Chinese Juniper is known for the many variations in shape and leaf color of this naturally sprawling shrubby tree. 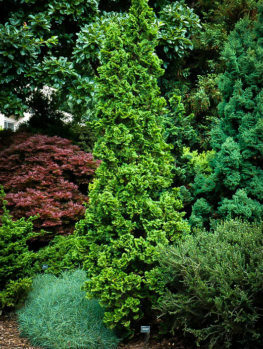 The Golden Glow Chinese Juniper stays low, at about 3 feet tall and as much or more across, with cheerful bright golden-yellow foliage all year round. This form has soft foliage, not the spiny needles sometimes found in Junipers, so children will love this golden teddy bear. 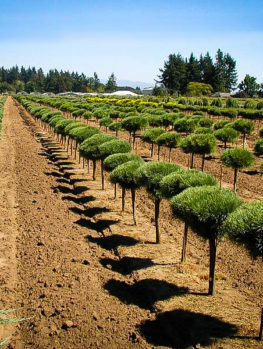 The spreading Blue Chip Juniper is considered to be the pick of the low-growing junipers that are so great for ground-cover and on slopes or banks. If you want to help someone cover a dry, sunny, sloping area, this beauty is hard to beat, growing just 8 inches tall, but covering several square feet. Another colorful evergreen, the Blue Star Juniper, takes the prize for steel-blue foliage coloring. We had our growers place this special tree on an upright trunk, so that it forms a beautiful rounded globe that can even be clipped into a perfect sphere is you want. 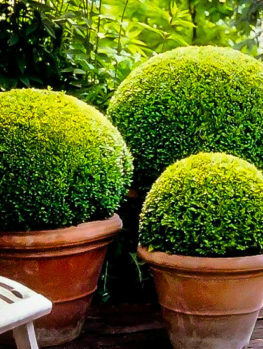 It is ideal for growing in a container, so it makes a great gift for someone who gardens on a terrace or balcony. It’s the perfect way to add height to those kinds of areas, where most plants in containers are low growing. 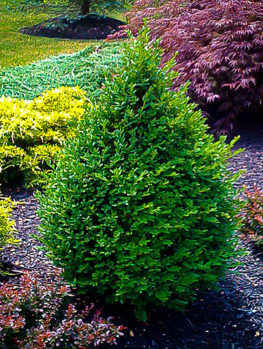 The different kinds of spruce are always popular with gardeners in the know, looking for beauty, ruggedness and easy care. 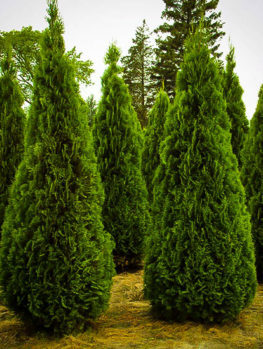 The Little Gem Norway Spruce is a special selection of the well-known Bird’s Nest Spruce, which has a much more compact habit. The Little Gem you gift your friend will always stay small and compact, making a perfect cushion of blue-green leaves just 12-18 inches tall and 2 feet across. 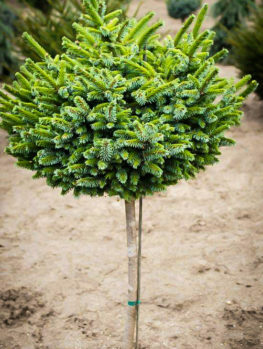 We have found another lovely spruce for the perfect gift, the Pimoko Serbian Spruce, which has a charming ‘spikey’ form, growing to about 12 inches tall in time, and around 2 feet across. 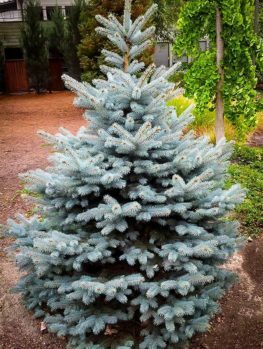 With its crisp blue needles this tree is great in the garden or as something special in a planter box or pot. 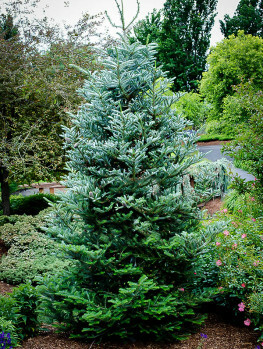 The Colorado Spruce is often grown as a front yard tree, but we found a lovely dwarf form mounted on a straight trunk, that looks perfect in a pot, or amongst the foundation planting around the house. 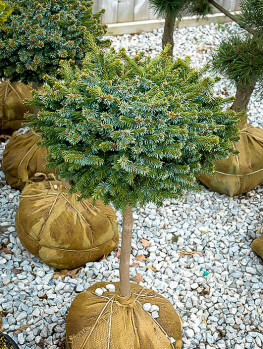 If you are gifting to the owner of a new home, no garden is complete without the Dwarf Colorado Spruce, which forms a brilliant blue ball on a trunk, ideal for the smaller garden or as a container specimen. 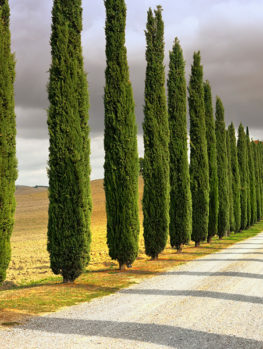 Pine trees are unique and instantly recognizable, with their long, soft needles. At the Tree Center we have chosen two special ones and had them placed on straight stems to put them up in the air where they can be admired. 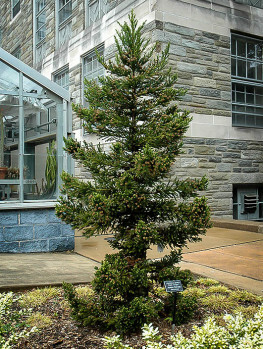 The first one is the Dwarf Mountain Pine. 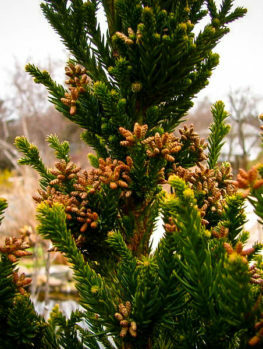 This enchanting little creature is a selected dwarf form of the Swiss mountain pine, which itself is already more of a large shrub than an upright tree. 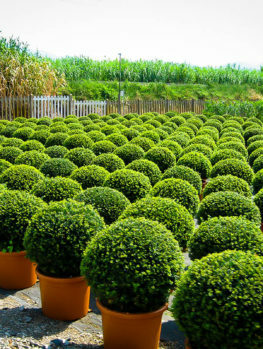 Forming a rounded shape that over time will become at least 3 feet in every direction, this is the perfect accent plant for any bed, or the perfect specimen to place in a large container. Our second choice is the Dwarf White Pine a miniature form of the majestic native white pine, seen in the north-east as a grand specimen tree. 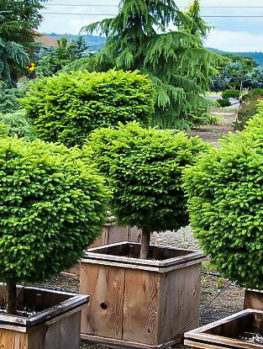 With long, soft needles in light green, this rounded plant stays compact and is a lovely specimen plant for the garden or containers. Both of these pines, symbols of rugged endurance in the face of adversity, make perfect gifts. The lemon tree is very pretty, and the lemon flower is sweet, but the fruit of the poor lemon . . . is so valuable in the kitchen that no-one should be without a tree to harvest from as they need it. Gifting someone a Meyer Lemon Tree is a great idea, for anyone who loves to cook or mix drinks, since this special lemon can very easily be grown outdoors in warm areas or indoors in a sunny spot or an enclosed porch. 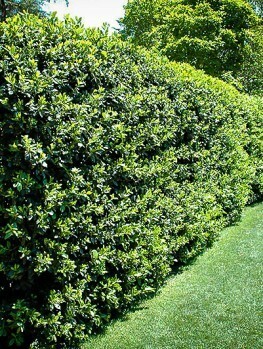 Because it stays small, the tree is ideal for pots, and will bloom and produce fruit from an early age. 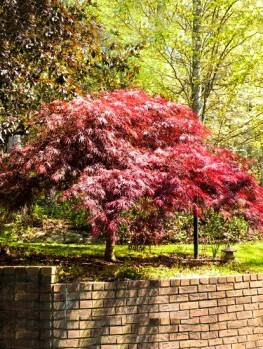 This tree originated in China, is easy to grow and is the perfect choice for a special gift. 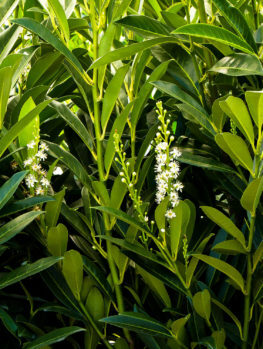 The Miho Satsuma and the Seto Satsuma are Japanese varieties that have been widely tested in Texas as outdoor trees and have proved to be very hardy and reliable. You might be in an area where you would not expect citrus to be hardy, but with this tree we are talking all the way into North Carolina, across the South and right up the West coast – an amazingly wide range now suitable for citrus growing. So a gift of one of these trees would be a marvelous and unexpected bonus for anyone in those areas who appreciates fresh, tree-ripened Satsumas from their own garden – and who wouldn’t? To develop a hardy Satsuma, breeders here in America have crossed the Changsha tangerine, a really hardy tree, with different Satsumas and come up with the Bumper™ Satsuma, another hardy tree which really lives up to its name. This is the ideal patio Satsuma, cropping heavily in containers and even more so in the garden. Whichever of these special hardy varieties you settle on as a gift tree, we know that the recipient will be thrilled, especially when they bring in their first fruits. 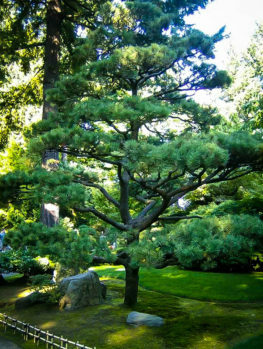 The art of growing trees for many years in pots was first developed in China and brought to perfection in Japan. 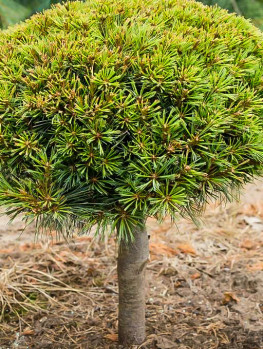 Once thought difficult to grow, we now know that a little simple care will keep these remarkable trees healthy and thriving for decades in any garden. These are the perfect gift for anyone who likes to play with their plants, as they can be trimmed, groomed, wired and enjoyed forever. We have chosen some special trees, growing in authentic containers that can be shipped right to the door of anyone you choose – think of how special that person is going to feel when this jewel of the East comes out of its protective box. A Bonsai tree has to be the pinnacle of plant gifts, a living symbol of long-life, calmness, spirituality and grace. Japan offers us another gift tree that will be enjoyed for years by whoever receives it. 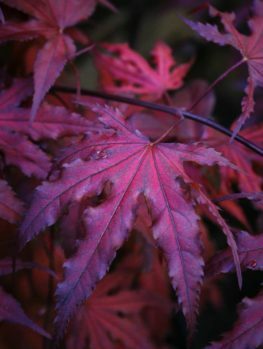 Japanese Maples come in a kaleidoscope of forms, with leaves in green, pink, red, purple, orange and yellow, not only in fall, but in spring and summer too. 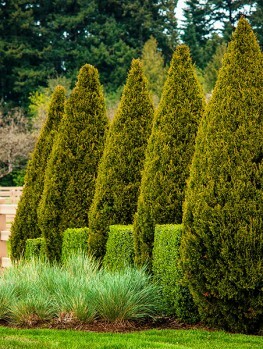 Some are upright; others are rounded and yet more cascade down to the ground like flowing streams of leaves. 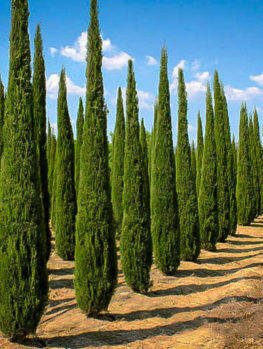 Whatever form you choose from our extensive collection, you can be sure that these special trees will bring happiness to every garden they grow in. 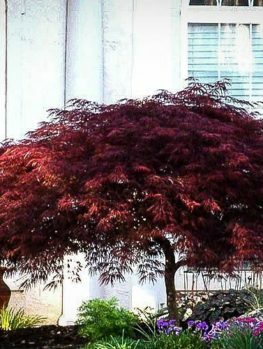 If someone is entering a new home, especially one with no existing garden, you can bet they could use a beautiful shade tree in their lawn. As the tree grows your friendship will strengthen and very soon you will all be gathering beneath the shade of this tree, celebrating the good times of summer and marveling at the beauty of the colorful fall leaves. 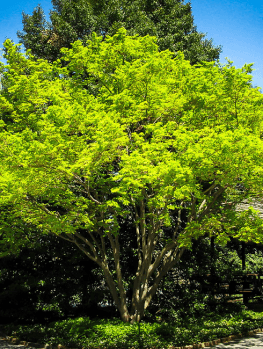 Take a look at our shade trees selection for more information on which trees are best for the particular area of the country you want us to send this tree to. 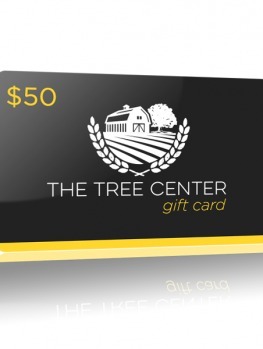 Find the Perfect Gift at The Tree Center! So give some thought to our many choices, confident that we will only send out the best, carefully wrapped and with a gift card enclosed, as well as care instructions, to the lucky person you have decided to send a Gift Tree to. Whether you choose from our special selections, or from our complete range, you can be sure this Gift Tree is going to thrive and give years and years of pleasure. For the gift that grows and grows, give a Gift Tree.